The wisps of material reaching inwards from the ring are mostly because of the gravity of the tiny moon. The Cassini spacecraft has captured an image of the Saturnian moon Prometheus near the narrow F ring. The wisps of material reaching inwards from the ring are mostly because of the gravity of the tiny moon. The F ring is the outermost in Saturn's ring system. 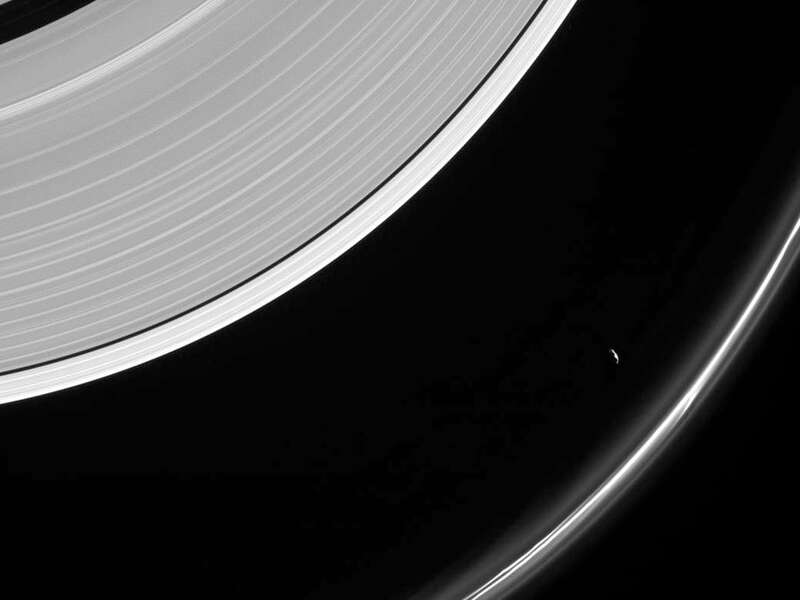 To the top right of the image is the Keeler gap, which contains another tiny moon, Daphnis, which is known as the waverider for causing kilometer-long ripples in the ring system. The Narrow Angle Camera has previously been used to capture a number of stunning images, including Mimas appearing to crash into the rings of Saturn, belts of features known as propellers in the rings, Daphnis in the Keeler gap, water jets near the south pole of Enceladus, clouds of methane streaking across the hazy atmosphere of Titan and Epimetheus, a pockmarked moon of Saturn. The Cassini spacecraft is the result of a collaboration between NASA, the European Space Agency (ESA) and the Italian space agency, ASI. The Cassini spacecraft is in the seventeenth of its grand finale orbits, after which it will burn up in the Saturnian atmosphere. There is not enough fuel left on the spacecraft for NASA engineers to maintain control, and the probe could drift into and contaminate the moons of Saturn, which may harbour life. In related news, NASA is looking for a Planetary Protection Officer to prevent probes from the Earth adversely affecting potential life forms on other bodies in the solar system.